We recently launched an Indiegogo to raise funds for our upcoming Inside/Outside Prison Abolition Study Group!!!!!!!!!!!!!! Check it out, support it if you can, and read below if you want more info about the project. 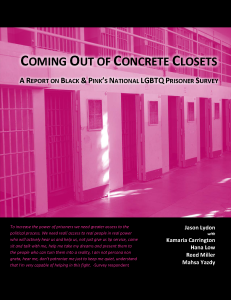 We’re planning the third round of our “Queer/Trans Prison Abolition Study Group” for this coming Fall 2015. This session will be quite different from the past two because instead of having only free world folks involved, we have 12 incarcerated members of Black & Pink who are interested in discussing the readings through penpal letters. 12 incarcerated folks will be paired with 12 free world folks. 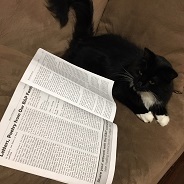 We send out 2-3 readings on prison abolition at a time to both our free world & incarcerated members. We ask our incarcerated members to send a letter back with their response to the readings: comments, questions, artwork, etc. The readings will be varied in style- some will be formal articles or excerpts of book chapters, others will be parts of graphic novels or mixed media/art. Our intention is to maximize reading accessibility for differing levels of education and learning style. Outside folks discuss the readings and integrate the perspectives from the incarcerated folks’ letters. At the end of each meeting, free world participants will write a short letter to their matched person. We audio record this discussion. After the meeting, the recording will be transcribed by a local transcriber who is in our community, or possibly by a formerly incarcerated person who does transcription, if we are able to find someone. Any content that might get labeled as a Security Threat will be edited to increase safety of our incarcerated members. Incarcerated participants are currently being held at CA Medical Facility, Mule Creek State Prison, CSP-Sacramento, San Quentin, and Central CA Women’s Facility. Free world participants currently live in Oakland, Berkeley, SF, and Marin. We need to raise $800. The money we raise will cover the cost of transcribing each session of the study group, so that we can send a full transcript in to our incarcerated members, rather than just notes or a summary. This will help them feel as if they were right there with us, and will mean that the bars of their prisons can’t stop them from learning and growing in community with us. We plan to pay a local person a living wage for transcription, which runs about $80-100 per transcribed hour. If you know a formerly incarcerated person who does transcription please put us in touch. Funds will also be used to cover the cost of bulk copying the readings we’ll be studying, the postage to send everything inside, and postage that we’ll be giving each incarcerated person to ensure they are able to send their responses. We will set aside a small amount to make available a transit subsidy to ensure that we make the study group accessible across class for our free world participants. We don’t anticipate having any leftover funds. If we do, we will put some of it on the commissaries of our 12 incarcerated members or use it to purchase each of them a book of their choice. If, by some weird miracle, there was any left beyond that, we will save it to cover the costs of visiting some of the incarcerated members who participate in the study group, as a few of them have expressed interest in being a part of our local leadership/advisory team and we hope to meet in person after the group is finished. $5- Shout out on Facebook!! $10- Shout out on Facebook, plus inclusion in an official thank you blog on our website!! 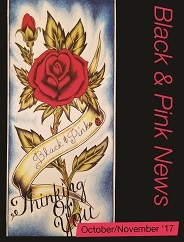 $20- Shout out on Facebook, plus inclusion in an official thank you blog on our website, plus a signed card by members of SF Bay Area Black & Pink, plus whatever Black & Pink schwag we can fit in your envelope. $30 Shout out on Facebook, plus inclusion in an official thank you blog on our website, plus a signed card by members of SF Bay Area Black & Pink, plus whatever Black & Pink schwag we can fit in your envelope, plus an Abolition Mix Tape (downloadable soundtrack of 15+ songs that inspire local prison abolition organizers). $40 Shout out on Facebook, plus inclusion in an official thank you blog on our website, plus a signed card by members of SF Bay Area Black & Pink, plus whatever Black & Pink schwag we can fit in your envelope, plus an Abolition Mix Tape (downloadable soundtrack of 15+ songs that inspire local prison abolition organizers), plus a homegrown spider plant baby (Limit 8, only available in SF Bay Area). $50- Shout out on Facebook, plus inclusion in an official thank you blog on our website, plus a signed card by members of SF Bay Area Black & Pink, plus whatever Black & Pink schwag we can fit in your envelope, plus one of the recently designed Black & Pink T-shirts (please indicate size). $55- Shout out on Facebook, plus inclusion in an official thank you blog on our website, plus a signed card by members of SF Bay Area Black & Pink, plus whatever Black & Pink schwag we can fit in your envelope, plus an Abolition Mix Tape (downloadable soundtrack of 15 songs that inspire local prison abolition organizers), plus one of the recently designed Black & Pink T-shirts (please indicate size). $85- Shout out on Facebook, plus inclusion in an official thank you blog on our website, plus a signed card by members of SF Bay Area Black & Pink, plus whatever Black & Pink schwag we can fit in your envelope, plus an Abolition Mix Tape (downloadable soundtrack of 15 songs that inspire local prison abolition organizers), plus a 13.5″x20″ print of “Onset of a Vision” on Epson Cold Press Bright paper. $100- Shout out on Facebook, plus inclusion in an official thank you blog on our website, plus a signed card by members of SF Bay Area Black & Pink, plus whatever Black & Pink schwag we can fit in your envelope, plus an Abolition Mix Tape (downloadable soundtrack of 15 songs that inspire local prison abolition organizers), plus a homegrown spider plant baby (Limit 8, only available in SF Bay Area), plus one of the recently designed Black & Pink T-shirts (please indicate size), plus a 13.5″x20″ print of “Onset of a Vision” on Epson Cold Press Bright paper.